Check our Community Page regularly for events, news, and adoption opportunities in our area. My name is Bella. 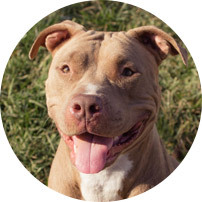 I am an approximately 4 year-old female pit bull mix. I am good with dogs and love children. I am a pretty laid back lady, but have my energetic moments when I play with my foster siblings. I do love to go for walks and make a great running partner. I have been at Speranza since the summer of 2016 and would love to find a family of my own soon! I used to live in a car with my puppies and my human. Sadly my human overdosed on drugs while in the car with us. She survived, but I was brought to Speranza with my puppies. I was a great mom and we were fortunate enough to be fostered with Dr. Pryor and his family. My puppies were all adopted and now I am waiting for my family to come while living in a new foster home. Winter is Around the Corner. Looking to rescue a furever friend?